I feel like I am doing something illicit as I drive away from Missoula on August 21, 2013. The Lolo Complex fire has burned 8500 acres, displaced 200 people from their homes, detoured and inconvenienced thousands more. As I travel west on I-90 I look over my left shoulder and see smoke from the fire drape itself like a five hundred foot thick blanket over the hills south of town. I feel as if I should stay with my fellow citizens, endure what they endure, not slip away to the north for a paddle under clear skies. By the time I get my first full view of The Missions the sky is clean and blue except for an area high in the Mission Creek drainage where a small fire is allowed to burn in the wilderness. Dropping into Polson I see that a steady breeze from the northeast has turned Polson Bay into a turquoise frappe. 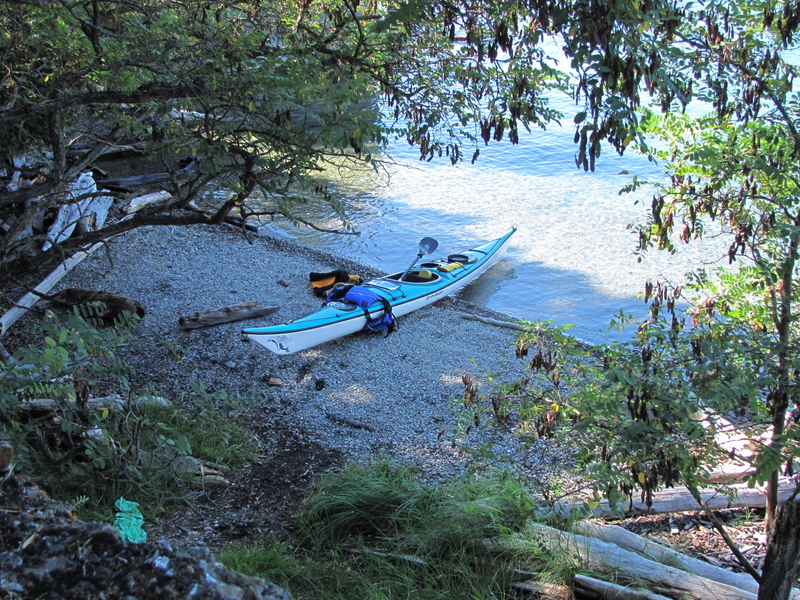 Today I want to paddle from Westshore campground down to Cedar Island, round the island, then head back north to Deep Bay for a swim, and return. So, I head through town, check out the fishing access site at Elmo as a launch site for a possible future paddle, then turn off at the campground further north. After unloading my boat and related gear I stand in the shallows. I want to get a feel for the lake and what it will permit. Modest white caps roll southwest down the length of the lake. I will have to take these waves on the port stern quarter for several miles. As long as the wind does not strengthen and start to blow the tops off the waves, experience tells me that I should be able to paddle back against this energy. It seems safe enough to proceed. Almost immediately I am in the grip of the wind and the waves. I deploy the skeg for a little directional assistance and added stability. Paddling gives me a chance to brace intermittently, as needed. A few fishermen speed by, their wakes adding to the mix. As is so often the case the waves are particularly unpredictable around Painted Rocks. Once again I won’t be able to take a photograph of the pictographs. Suddenly the island comes into view. I proceed with my plan, speed down the east shore of the island and swing around into the lee. Only an osprey on a snag breaks the quiet. The bird seems incensed that I have intruded upon its morning. I drift into the rock shelter near the derelict home on the island. I extract my lunch from the hatch and climb the rocks so I can look out on all the water to the north. I find my spot—part sun, part shade, and enjoy my peanut butter and jelly sandwich. Below me waves roll the logs trapped against rocks. Blue, green, and yellow mix with each other according to the depth of the water. Everything is airy and bright. I leave my vantage point feeling refreshed. On my way back to the boat I find a particularly fine goose feather, and pick it up for admiration. Before dropping back into Bluebird I wade out into the water to pick up a glass lemonade bottle that someone tossed away. I stow it in an extra bag in my rear compartment. I don’t want broken glass in these shallows. If I were really responsible, I would also remove the green shirt someone left behind. I am not quite that conscientious. I use my paddle to move it away from the water’s edge and hide it among the drift logs. I hope it will degrade. I always feel a little anxious as I head out into the wind and wave train that now advances toward me. I remind myself to trust the cumulative effect of thousands of strokes. I glance to my left for reassurance and see that I am indeed moving north in relation to the shore. The day may come when I will not be able to move against these forces, but for now it feels good to apply myself in this way. After a couple of hours I am at the mouth of Deep Bay but need to adjust my course to make way for the enormous tour boat operated by Far West Cruises. Tourists look shoreward from the canopied upper deck and never see me. I am not sure the captain does either, preoccupied as he is with his narrative about the lake. I feel grateful for the intimacy I have with the lake compared to their far remove. I haul out in the bottom of the bay, wade back in and take the plunge. This is as warm as the lake will ever be, I tell myself. It feels good to be thoroughly wet, head to toe. On my way back to the campground I stay very close to shore. I pass through the milky water against the cliff, wondering if there is a clay deposit here, and see that in late August the reds and yellows of autumn are beginning to emerge on the dry slope above. Bathing beauties sun themselves on the gravel where I normally pull out, so I slide up the adjacent concrete boat ramp and am careful to not let Bluebird come to ground against the abrasive surface. As I begin to carry everything back to the truck someone calls out, “Hey, I like your craftsman-style boat rack. Mine is made of two-by-fours and screws. Yours is beautiful.” I am not sure how to respond and can only muster, “Thanks. Yours works as well as mine.” I laugh to myself thinking, my truck rack may be the most-admired thing I ever made. As I drive back down the west shore of the lake I return to the sense that I stole this day, stole it from school preparation, stole it from my community laboring under the smoke, stole it from the grip of anxiety. As I head south I try to bring along with me today’s experience of ease and pleasure at paddling in clear water under a clear sky. I return bearing treasure.